Good morning, Expo passengers. 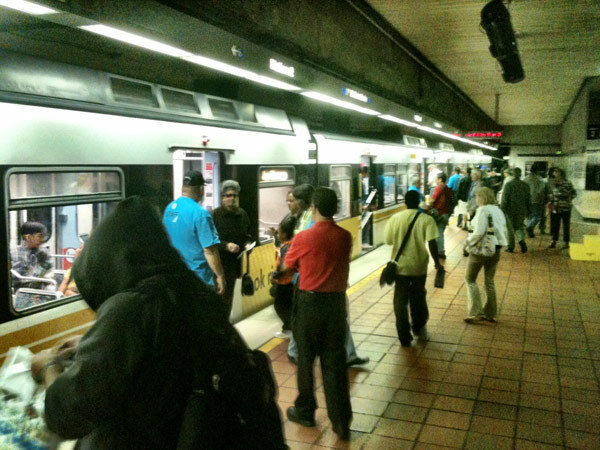 First note of the day: Expo trains are leaving from platform 2 at the 7th/Metro Center station in downtown L.A.
UPDATE 10 a.m.: Operations reporting smooth boarding at 7th St. / Metro Center Station, with lots of staff directing. (You can tell they’re staff If they’re smiling and wearing an aqua t-shirt stamped Expo) Also, the aqua shirts at La Cienega are directing Expo passengers to enter at the east platform and exit at the west platform.